← Is there really money in Agriculture? 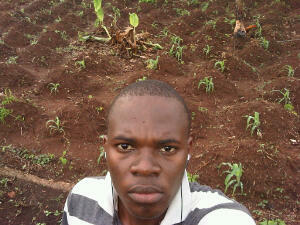 at my Yam/Melon/Maize Intercropped Farm. Crop Farming is a very old profession, but is it for Old people? Certainly not! The population of Farmers are declining because there are old dyeing farmers in the system, with over a Billion people worldwide going hungry due to the declining population of farmers, as well as other factors there is a great need now more than ever before for young people to go into crop farming. Why crop farming? Crop farming is a very lucrative form of Agri business anywhere in the world, this is because everyday people consume one form of crop or the other. Take a sheet of paper and list the foods you have eaten this week, you may notice you ate more crop foods than animal Aha! How can youths really make money from crop farming? That is the question ringing on the minds of a lot of young people today. Many have thought of ways to make money but have been deceived to believe they have to wait for cassava (9 – 12 months), Cocoa and other crops. The fact is that if you are an unemployed youth who have no source of income, going into long term crop farming is a discouragement in itself, having to wait over a year when you don’t have any monthly income has indeed been one of the reasons youths are not fully in Agric. The next blog in the series: Using innovative ideas to make money in: Crop Processing and packaging will highlight innovative ideas on how a young person with little or no cash can make money from processing and packaging crops that take over a year to mature (late maturing crops). This is a practical session and I challenge every young reader of this blog to take action and follow these innovative ideas in order to make money from crop farming. IDEA 1: Making money from crop farming by improving farmers yield: The biggest problems of most crop farmers worldwide is to maximize the full potential of the soil to produce bumper yields, however due to several factors (excessive fertilizers applications, incorrect herbicide use, and others) the soil may not be able to give its full yield, how can you help the framers and make money from this? Soil Remediation: I am not going to give you the academic terminologies so that ANYONE reading this can understand what I mean, it is simply the application of various methods to improve the soil for optimal production/yield. ACTION PLAN: Talk to crop farmers co-operative groups in your area especially those who are very concerned about their yield and propose to help them ameliorate the problem, if the farmers accept, you may need to look for poultry droppings, wood ash, and other organic compostable materials and use them to apply on the soil and get your cool cash, again you may not involve yourself with any of the carrying of poultry droppings, wood ash or any of those materials. Depending on the money you realized from the farmer you may get cheap labour to do all the work, except of course discussing with the farmer’s cooperative! IDEA 2: You noticed in the first idea, you solved a farmer’s challenge and you were paid for it. Another challenge most Crop farmers face is in the area of Sales and Marketing. How can young people make money from this challenge? Online Sales and Marketing: Am sure a lot of youths are not new to this, as they visit several social networks, blogs and websites. Online sales and marketing is simply the advertising and marketing with a hope to achieve sales on the internet. ACTION PLAN: Shortly before the harvest season, inquire from crop farmers in your area about how much they intend to sell their crops, with the intent that you will buy from them in large quantities. Then go online and create a good marketing campaign online, don’t be discouraged and say people won’t respond or buy! Snap pictures of the products or Google them and highlight why people will buy that product and don’t forget to add a good price to entice the prospective customers! Now imagine a farmer offers to sell a ball of 2Kg watermelon to you for 2$(about N300) and you advertise it to sell for $3.5(about N500) online and you were fortunate to have a single order of 100 from a grocery reseller, you would have made about $150(about N20,000), now if you can be making such supplies every week am sure you know how much you will earn in a month! (1) you have land or space for that, (2) you are willing to invest money into buying of seeds and inputs, hiring of labour and other running costs. That is why it comes last, when you realize money from the two ideas, you can apply it on the third. ACTION PLAN: Prepare a piece of land and plant short maturing crops, fruits and vegetables: Water melon, Green Amaranth, Cucumber, Carrot, Fluted Pumpkin, Maize. You can intercrop several crops like Maize & Watermelon and still achieve a good yield (using a good planting distance and applying IDEA 1). You don’t need to have a big space to do vegetable farming; with intercropping and good spacing methods you can grow several crops on the same piece of land comfortably and make your cool cash in less than 3 months! ACTION PLAN2:Grow crops when they are out of season, Vegetable crops are required by consumers at all times of the year but due to the availability of rains, there is a particular season when we expect to see all this crops, should that continue that way? No! Imagine been the only one in your area when having fresh vegetables all year round…that’s some good cool cash. If you are still wondering whether it is true, then know this fact: While doing my NYSC in Calabar, Nigeria, I saw something that shocked me to my marrow. Towards the end of the year when the Fluted pumpkin Vegetable was out of season, a woman made about $100(N15,000) from the sales of her Fluted pumpkin on a single day and before the end of that week, she had made $160(N25,000) simply because she was wise to start planting when others stopped! Now, before you rush to start planting fluted pumpkin, understand your area, your market, and ask yourself these questions: What crop produce/vegetable do people need MOST in my area? Is the demand of these produce been met? Will people buy costlier from me if I sell it to them off season? After getting the answers herein, you can go ahead and plant! *This are only few ideas I can share with you on this topic, I challenge each Young person reading this t apply all the 3 ideas and 4 action plans, even in a better way than I outlined them here…together, we will feed the hungry population and indeed make cool money from agriculture! This entry was posted in Agri-Innovation, Agribusiness and tagged Crop Farming. Bookmark the permalink. Smart one Mr Sam. There is still pride in integrity and working smart and not working hard like it’s obtainable with the ageing farmers and other folks out there. Food will always be the #1 on the table, clothing and shelter sure have there places too but in the end, you still have to be alive to live in a good house or wear clothes to accentuate your beauty. @Sola, you are very correct…Youth should give Agric just a little attention they have given sports and entertainment because they have to work smart,not hard as they think they will.Applying these ideas will make a big difference in anyone’s life for the better! Thank you. This article just changed my life. Aha! Thanks for stopping by to read my blo Mr. Shedrach, I really appreciate!